Question: We have a fireplace that we hardly ever use, maybe once or twice a year. We have installed glass doors on the front of the fireplace and we keep the damper closed, but we can still feel the cold air from coming down the chimney and I am sure that we are still losing a lot of hot air from our forced air furnace up the chimney. Is there anything we can do to stop the heat loss? Answer: Actually there is a relatively simple and inexpensive solution to your problem. A relatively new product in the market place to prevent chimney heat loss is the "inflatable chimney balloon or pillow ", as shown in Figure 1. 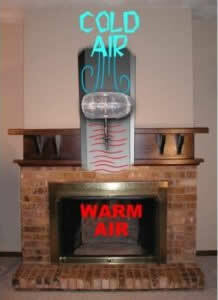 The inflatable balloons or pillows come in a variety of sizes that will suit almost any internal chimney size. They are simple to install and simple to remove when you do want to use the fireplace. Other types of pillows are designed to block air movement around the damper. I am reasonably confident that there is an inflatable chimney balloon or pillow that will seal your chimney.